As landscape architects and arborists we often find that plant material on our new residential, commercial and HOA sites have been left to get overgrown and mismanaged. The key to getting the plant material looking healthy, vibrant and growing properly again is of course dormant pruning. Dormant pruning takes place during the winter months and this is valuable for many reasons. With the leaves absent precision pruning is much easier. Cutting the plant in the right spot helps the plant heal better and faster in the growing season. It also allows us to see the shape of the plant better and see limbs and stems that are either damaged, diseased or crossing. The colder months also mean less airborne diseases that could affect the fresh wounds of plants. A sure sign that dormant pruning needs to be done is the evidence of witches broom which is a dense mass of shoots growing from a single point. This happens when the plant is perpetually pruned or sheared on the top and never in the middle or base of the plant. This type of pruning leads to a plant that is top heavy with leaves, but looks bare and leggy on the stems and base. Dormant pruning removes the witches broom, allows us to remove overgrown stems at the base of the plant and makes it easier to remove unwanted growth. These fixes allow sunlight and air to get to the entire plant and not only to the top sections. Heights of plants are also much more easily controlled during dormant pruning allowing the plant to take on a natural shape during the growing season without blocking windows or doors. This entry was posted in ILT Vignocchi, Maintenance, Shrubs, Trees and tagged dormant pruning, HOA, horticulture, ilt, iltvignocchi, landscape architecture, landscape contractors, landscape design, landscape ideas, landscapers, landscaping, maintenance, north shore, shrubs, winter gardening on February 7, 2019 by iltvignocchi. This past weekend, on a particular hot sunny Chicago day, our family thought it would be an adventure to visit Chicago’s Morton Arboretum to see the Troll Hunt Exhibit…with our 9 year old daughter. Did I mention it was very hot, very sunny, AND that the trolls in some places are 3/4 of a mile from parking areas? It was really fun for the first half hour, let me tell you. But although nature became a bit of a bore to our darling daughter, the Arboretum is a marvel to me. It is nothing like a Botanic Garden, it is more like an organized forest for one. Another shocking revaluation? There are weeds, lots of them, which I found mind blowing but very refreshing. The Arboretum was founded in 1922 buy the son of the man who founded Arbor Day. It spans a tremendous 1,700 acres holding more than 222,000 live plants representing nearly 4,300 taxa from around the world. What is so wonderful is that it made me feel so small, so unimportant, yet so at peace. The Trolls, although fantastic, were such a secondary draw to all of the different species, elegant groves, and meandering walkways. One thing I did appreciate about the Trolls is they were fashioned to completely meld into nature…as if they lived there in harmony in what felt like the most peaceful place on Earth. During these times when tensions always seem to run high and meaningful personal interaction is on the decline, I encourage you. Take your family, take a friend, go with a neighbor. Walk around and take in the splendor. Talk to one another. It’s good for your soul. This entry was posted in ILT Vignocchi and tagged morton arboretum, nature, peace, shrubs, trees, Troll Hunt on August 16, 2018 by iltvignocchi. Every autumn in Illinois brings with it a breathtaking change of color in the leaves of our trees, but although it’s late September, temperatures have been steadily topping out in the nineties every day. Not a traditional sign of Fall, yet the trees are changing color and dropping leaves as if they were not aware of the hot and humid weather. Aren’t the leaves supposed to change when it gets cooler and we see some frosts overnight? Do the trees know what time of year it is despite the unusually warm temperatures? One explanation, according to Native American myth, is that the hunters in the Heavens killed the Great Bear in autumn and its blood dripped over Earth’s forests coloring some of the leaves red. As the hunters cooked the meat, fat dripped from the Heavens and colored some of the leaves yellow. Not scientific enough for you? Need a more botanical answer? Most people think that cool weather or frost causes the leaves to change color. It is true that there is usually a correlation between the cooler air and the onset of the autumn show. However, while temperature may impact the color intensity, it has less impact on the timing of the color transitions we see in the Fall than do other factors. A quick trip back to high school Botany 101. During the spring and summer most of the foods necessary for the tree’s growth are manufactured in the leaves. This food-making process takes place in the numerous cells containing chlorophyll, which gives the leaf its green color. This extraordinary chemical absorbs the energy from sunlight that is used in photosynthesis, the transformation of carbon dioxide and water to carbohydrates, such as sugars and starch. In late summer or early autumn, the days begin to get shorter, and consequently, the nights are longer. Like most plants, deciduous trees and shrubs are rather sensitive to the length of the dark period each 24-hour cycle. When nights get long enough, the cells of the leaves begin to block transport of materials such as carbohydrates from the leaf to the branch. They also block the flow of minerals from the roots into the leaves. Because the starting time of the whole process is dependent on night length, fall colors appear at about the same time each year in a given location, whether temperatures are cooler or warmer than normal. The fact is, the vivid yellow and orange colors have actually been there throughout the spring and summer, but we haven’t been able to see them. The deep green color of the chlorophyll, which helps plants absorb life-giving sunlight, hides the other colors. In the fall, fewer hours and less intense daylight prompt the leaves to stop the food-making process. The chlorophyll breaks down, the green color disappears, and the yellow and orange colors already in the leaf become visible again to the human eye. As the trees break down the green pigments and nutrients stored in the leaves they are shuttled into the roots for reuse in the spring. Along with the green pigment of chlorophyll are carotenoids, yellow to orange pigments, which, for example, give the orange color to a carrot. At the same time other chemical changes may occur which produce red anthocyanin pigments resulting in even more variation in the Fall color scheme. Some mixtures give rise to the reddish and purplish fall colors of trees such as dogwoods and sumacs, while others give the sugar maple its brilliant orange. For most of the growing season these colors are masked by the great amounts of green coloring. The variations in Fall color are due to the mixing of varying amounts of chlorophyll residue and the other pigments in the leaf combined with a varied response to weather conditions. For instance, as the nights become cooler, the sugars trapped in the leaves of some oaks and maples will often form a red pigment. 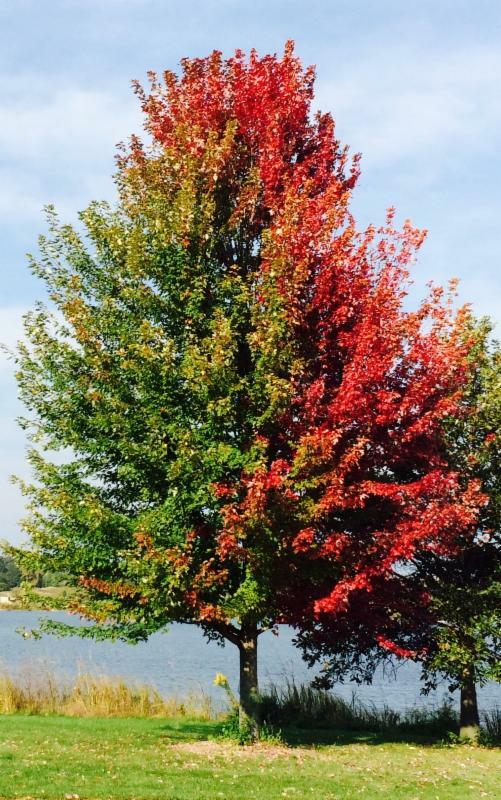 The degree of color will also vary from tree to tree. Leaves directly exposed to the sun may turn red, while those on the shady side of the same tree or other trees may be yellow. As the fall colors appear, other changes are taking place. At the point where the stem of the leaf is attached to the tree, a special layer of cells develops and gradually severs the tissues that support the leaf. At the same time, the tree seals the cut, so that when the leaf is finally blown off by the wind or falls from its own weight, it leaves behind a leaf scar. Most of the broad-leaved trees in Illinois shed their leaves in the fall. However, the dead brown leaves of the oaks and a few other species may stay on the tree until growth starts again in the spring. In general, autumn weather conditions favoring the most brilliant colors are warm sunny days and cool, but not freezing, nights. When there is mainly warm, cloudy and rainy weather in the fall, the leaves may have less red coloration. A few hard frosts can cause the leaves to wither more quickly and drop to the ground. So, in case you were wondering, with all due respect to the Native American myths, it is a combination of temperature, light, and water supply that have an influence on the onset, the degree, and the duration of fall color. Enjoy it while you can, because it doesn’t last long! This entry was posted in Fall, ILCA, ILT Vignocchi, Maintenance and tagged fall, fall color, fall flowers, horticulture, iltvignocchi, landscape, landscape ideas, landscapers, shrubs, tips, trees on September 27, 2017 by iltvignocchi. About 20 years ago we sold our facility in Prairie View, IL and relocated to two new facilities, one in Wauconda and one in Island Lake. Our facility in Island Lake is home to our production teams, mechanics and outside material storage. Our facility in Wauconda started as a corporate headquarters and evolved, thanks to our very entrepreneurial founder, into an impressive shrub, perennial and groundcover wholesale nursery…Montale Gardens. To those in the industry, the evolution from landscape professional to nurseryman is a natural one. Most of the companies I know who have done it do so for a myriad of reasons…cutting cost, controlling quality, and revenue growth. My father and I are very proud of our little sister nursery…she has the same culture and values as her big brother landscape company. Those of service, fun, integrity and quality. This winter, under the new leadership of Melisa Bell, Montale got a brand facelift. When it comes to our image (we are Italian so the vanity runs quite deep) we are emotional and opinionated. So the process was argumentative yet fun, painful yet invigorating. When all was said and done, we are all so proud of the end result. Here is a peak at the evolution, starting with my father’s original ILT logo, it’s next incarnation, Montale’s new logo, and their new look on display at the very popular industry trade show, ilandscape. Harry Vignocchi’s original tree logo as seen to the left. This entry was posted in Uncategorized and tagged branding, groundcovers, marketing, montale, nurseries, perennials, rebranding, shrubs, wholesale on March 10, 2017 by iltvignocchi. If you’ve ever seen Bottlebrush Buckeye in bloom, you’ll agree it’s aptly named. This dense, multi-stemmed shrub with picturesque, ascending, candelabra-like branching typically grows 6-12’ tall. It features palmate dark green leaves (5-7 leaflets) turning to yellow-green in fall. In late June-early July, this plant “wows” me with its gorgeous white bottlebrush-like flower spikes that grow 8-12” long. Its showy flower spikes burst onto the scene just around the fourth of July, I deem them as Mother Nature’s 4th of July celebration! This broad-spreading, shade tolerant shrub appears to flow across the landscape. It can be used to great effect for massing, clumping or placing in shrub borders. It also performs well under shade trees and other shady areas. It prefers moist, well-drained soil and will grow in full sun to partial shade. It’s also very deer resistant. Uses: Excellent specimen, group or mass in shrub borders or woodland areas. Problems: No serious insect or disease problems. This entry was posted in ILT Vignocchi, Shrubs and tagged Aesculus parviflora, Bottlebrush Buckeye, design ideas, ilt, iltvignocchi, landscape, landscape ideas, Large Shrubs, planning, shrubs, tips on March 23, 2015 by iltvignocchi. During the spring we generally receive a sufficient amount of moisture. Spring to summer is probably the most critical transitional period because moisture levels can drop quickly and soil moisture availability rapidly declines. This situation can be exacerbated by overly hot and windy conditions. When plants start to show signs of stress by wilting permanent damage to the vascular system may have already occurred. Prevention is the key; therefore we have prepared the following guidelines on the basics of proper watering procedures. The BEST time to water is about 3 a.m. to 10 a.m. At this time the air is cool and very little evaporation loss occurs before the water reaches the ground. When the sun rises and the air warms, the liquid quickly evaporates from the leaves. Watering early in the evening encourages fungal infection (fungal infections thrive in cool wet conditions); watering in the heat of day is bad because much of the water evaporates before reaching the ground. This accelerates buildup of soluble minerals in the soil that over along time can be ruinous to soil health. When you water, water deeply. This means water for a long time, allowing the water to soak into the ground. Ideally, you should provide one inch of water with every soaking, but not more than once per week. Remember to take rainfall into consideration when monitoring your watering. Use a rain gauge to monitor the amount of water your landscape receives from rainfall and your irrigation system (if applicable). Be careful…you can over water your plants! Roots need both water and oxygen to thrive. Over watering can kill plants because constant moisture suffocates the roots, thereby causing them to die and rot. Inspect the area BEFORE watering by tunneling with a deep root feeder or stake. If the soil is dry on top, it might still be moist underground and not need water. When watering newly planted trees, remove the nozzle from your hose, wrap the hose in an old bath towel (so it will disperse the energy of the spray) and set the hose at the base of the tree. Water the area at a low pressure every other day (45 to 60 minutes) for 3 to 4 weeks, based on your soil conditions. Make certain to change the position of the hose to water evenly. Shrubs can be watered similarly to trees except the time frame drops to 10 to 15 minutes each. Avoid watering foliage, most plants DO NOT like being watered from above because moisture build up on leaves encourages fungal problems. For more information there is a great article by the University of Illinois Extension. This entry was posted in Irrigation, Shrubs, Trees, Watering and tagged ilt, iltvignocchi, irrigation, landscape, shrubs, tips, trees, watering on September 2, 2014 by iltvignocchi.